I hope you enjoyed the first two weeks of January with my compilation of the best items from Ebay in the year of 2014! But as of today I am back in the business and present you the first Ebay bargains in this year! As for todays bargains- the item that definitely has my curiosity is the lion/tiger print skirt! I just think that the skirt looks pretty cool and I am not sure whether I have seen a skirt like this before! Es ceru, ka jums patika pirmo divu Janvāru nedēļu Ebay raksti, kas bija veltīti vislabākajiem Ebay atradumiem 2014. gadā! Savukārt no šodienas atkal variet sagaidīt manus iknedēļas Ebay bargains rakstus un es domāju, ka tiešām turpināšu šo sēriju arī šajā gadā! Runājot par šodienas atradumiem, mana mīļākā lieta pavisam noteikti ir lauvas/tīģeru raksta svārki! Manuprāt, raksts ir patiešām unikāls un es neesmu iepriekš redzējusi šāda veida svārkus, tāpēc, var teikt, ka es patiešām esmu ļoti ieintriģēta! Maddie a fantastic special set!!!! Want the watch and the skirt too!! What a cool skirt – so unique and fierce. 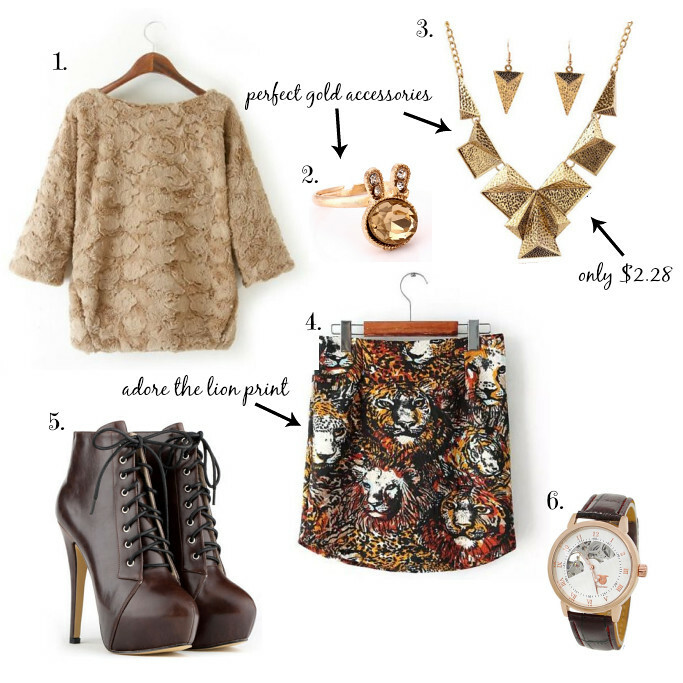 Love how you styled it too – that statement necklace brings the whole look together. Love these fabulously finds! The tiger skirt is awesome and I do love the faux fur top, it was popular. No need to apologize. Great bling, incredible prices! these are some great picks! love the necklace! I love the top and the bunny ring! Precious booties! I love the statement necklace too! yet againt I love all the items from your list and they would really look awsome together! I love the fur top, very cool and I haven't seen anything like it I must say! Great selection my dear Maddie! I love the skirt and the sweater. making it so fabulous! Wow!! I absolutely adore the neutral and gold colors in this finds Maddie! you are truly amazing when it comes to fashion and styling! love those pair of shoes sooo much!!! I mean I love every single thing here!! !